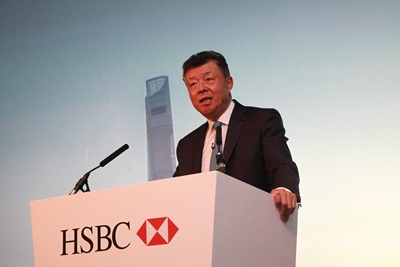 It gives me great pleasure to join you today at this HSBC China and RMB Forum on the theme of “Rising to the Challenges, Shaping a Different Future”. The topic is most timely and offers immense opportunity. Just as every coin has two sides, every challenge comes with opportunities. And in the financial cooperation between China and the UK, there are far more opportunities than challenges. Here are the three reasons why I am confident of this. First, the internationalization of RMB is accelerating. · At home, China has in recent years taken measured steps to make the RMB exchange rate more market-oriented. · And China’s capital market has been gradually opened up. · In the global market, the RMB is steadily becoming an international currency. 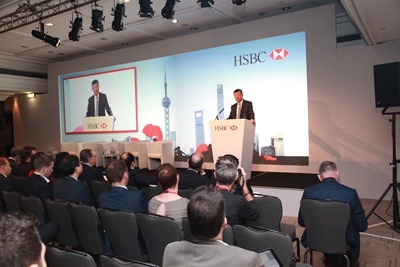 · And China’s financial sector is operating to a higher international standard. · In 2015, more than two trillion RMB yuan was used in the settlement of cross-border direct investment, and the offshore RMB bond totalled 393 billion yuan. · And it is estimated that by 2020, half of China’s foreign trade will be settled in RMB. · This is a milestone. · It will boost the RMB’s internationalization. · It is a fresh push on the reform of the international monetary system. · And it will also generate new vigour and vitality for China-UK financial cooperation. · In 2014, the British government issued the world’s first RMB sovereign bond here in London. · A year later, the People’s Bank of China issued the first RMB-denominated central bank bills also here in London. · In May this year, China’s Ministry of Finance issued the first RMB treasury bonds once again here in London. · In a few years time, this city has witnessed a number of “firsts” in RMB bond issuance. · At the same time, Chinese financial institutions have come to London one after another to set up branches. · In March this year, London overtook Singapore to become the world’s major RMB settlement centre, second only to Hong Kong. 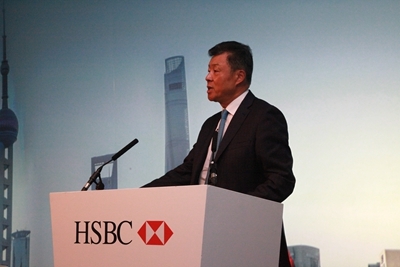 · Such progress has helped cement the foundation of China-UK financial cooperation. · And it has made further improvement and upgrading of our financial cooperation possible. · For China, opening-up is a core strategic choice. · As President Xi Jinping said at the G20 Hangzhou Summit, China’s opening-up will not stall, still less will it reverse course. · Going forward, China will continue to lower the threshold for foreign investment, improve facilitation, promote fair and transparent competition, and create a more business-friendly environment. · Now a new system for developing an open economy is taking shape, with the establishment of four pilot free-trade zones, including the one in Shanghai. · And seven more are to be designated. In the years ahead, China will open its door wider than ever to foreign investment. Please be sure, my friends from the UK business sector, of this certain advancing trend. Going forward you will find a more rule-based, business-friendly and transparent commercial environment in China. One commitment to openness is the ‘Belt& Road’initiative. This is a major plan of China to deliver an all-round opening-up. Britain and some 70 other countries, international and regional organizations have expressed their readiness to support and participate in this initiative. · The China Railway Express has to date made over 1,500 routine journeys over land between China and Europe. · Trade and investment in regions along the ‘Belt & Road’ routes are growing at a speed almost twice the global average. · In 2015, China’s trade with ‘Belt & Road’ partner countries exceeded one trillion US dollars. · Notably, the ‘Belt & Road’ projects have strong financial support. · The support comes from the Asian Infrastructure Investment Bank. · It comes from the investment of the Silk Road Fund. · And it comes from the bilateral and multilateral financial cooperation funds that countries along the ‘Belt & Road’ are actively involved to establish or expand. · It will benefit regional development. · It will boost global growth. · And it will definitely bring more opportunities to facilitate closer cooperation between China and Britain in finance, trade, investment, and in many other areas. · Last October, President Xi Jinping paid a very successful “Super State Visit” to the UK. · Our two countries announced our commitment to jointly building a global comprehensive strategic partnership for the 21st century. · And together we unveiled the “Golden Era” of China-UK relations. · Last month, Prime Minister May was in Hangzhou for the G20 Summit. She had a successful bilateral meeting with President Xi. · The two leaders reaffirmed the “Golden Era” for China-UK relationship and reiterated their shared commitment to bringing our global comprehensive strategic partnership to a higher level. · In the coming months, China and the UK will co-host the Economic and Financial Dialogue, Strategic Dialogue and the High Level People to People Dialogue. · And these high-level mutual visits and dialogues will further promote our practical cooperation in the field of business, finance, cultural, international and people to people exchanges. I often say that a “Golden Era” must bear ‘Golden Fruits’. We should be confident in a promising future for China-UK relations. What is more, we should seize the opportunities when they come along. We must work hard and take real actions to deliver more ‘Golden Fruits’. I believe more efforts are needed in the following aspects. · The internationalization of RMB is a step-by-step process. It is a process that will not stop and cannot be stopped, as it is in line with the trend of China’s deeper integration into the global economy. · And it will also help improve the global monetary and financial environment for growth. · This is an area where we can dovetail respective strengths and produce mutual benefit. · And this is an area where we can create a brand name for China-UK cooperation. As China’s market-based reforms of the exchange rate regime continues, RMB will gradually grow from a trade currency to a quote currency and finally to a reserve currency. That will give London a further advantage and allow the offshore RMB business in London to grow at an even faster speed. · We can work together on the variety of financial products and the scale of transactions. · We can work together on the preparations for the interconnectivity between our financial markets. · We can work together to expand and deepen cooperation on RMB internationalization. · And together, we can make the pie of common interests bigger. · The ‘Belt & Road’ initiative is not China’s one-man-show. Anyone is welcome to join in and catch this express train bound for a future of development. · The ‘Belt & Road’ links countries together through trade and investment facilitation and offers opportunities for win-win financial cooperation. · And our vision for the ‘Belt & Road’ is to build a platform for all-dimensional, cross-field cooperation among multi-entities. Here, the UK has unique advantages. These include the financial and legal services as well as talent resource it can offer to the countries along the ‘Belt & Road’ routes. In financial services, Britain has rich experience in international financing and mature management expertise. You have close financial interactions with countries along the ‘Belt & Road’ routes, who will soon be in need of innovative financial cooperation to bring in capital, expertise and experience. China and the UK will find huge potential for financial cooperation with these countries. In legal services, Britain is a world leader and the origin of the common law. British leadership in international commercial arbitration and disputes resolution is widely acknowledged. Legal services in ‘Belt & Road’ projects can be a new area for China-UK legal exchanges and cooperation. With respect to human resource training, the UK is also well placed, given its world-renowned think tanks and prestigious universities. China and the UK can join hands to explore ways and means of cooperation in this regard so as to offer strong intellectual support to the building of the ‘Belt & Road’. In short, the ‘Belt and Road’ is setting the stage for China and Britain to engage in multiple forms of cooperation. The opportunities are limitless. · Britain is China’s major trading partner and investment destination in Europe. · The Brexit referendum has certainly not dampened the enthusiasm of Chinese companies about investing in the UK. · And, on the contrary, it opens a door to the possibility of exploring a higher level of bilateral trade and investment arrangement. · This flagship project is so far the single largest Chinese investment in the UK. · It is in fact larger than any other Chinese investment in Europe. · It is indeed a ‘Golden Fruit’ of the “Golden Era”. · And it is a symbol of China-UK win-win cooperation moving up to the next level. · We look to the smooth execution of the package deals related to the Hinkley project. · We hope that their implementation will benefit the people of both countries and serve as a fine example for cooperation in other fields. · Our two countries can probe deeper to find out where our development strategies can dovetail. · We can encourage greater cooperation on nuclear, high-speed rail, infrastructure building and other major projects. · We can continue to expand the scale of mutual investment and trade. · And these endeavours will open up more space for China-UK financial cooperation. · Both China and the UK are countries with global influence. · And our relationship has been growing in strategic importance and global significance. It goes far beyond the bilateral scope. The G20 Hangzhou Summit is a recent example. Thanks to the concerted efforts of China, Britain and all other member states, the summit was a complete success. The outcome of this summit reflects the international consensus on global economic governance and charts the course for deeper international economic cooperation. · They will implement the financial reform measures. · Closely monitor and address the underlying risks and vulnerability of the financial system. · Deepen cooperation on financial inclusion and green financing. 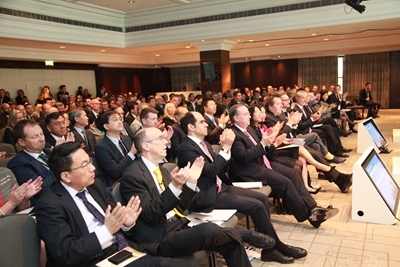 · And jointly maintain stability in international financial markets. In the recent years, China and the UK have achieved much progress in our cooperation on green financing. We have jointly contributed to transferring more economic resources to green industries. Going forward, China and the UK need to continue working with other G20 members towards a more just and efficient global financial governance.To achieve that, we must work hard to implement the outcomes and consensus of the Hangzhou Summit. In addition, we need to reinforce the cooperation within multilateral financial institutions such as the IMF, World Bank and AIIB. · I hope you will make good use of this forum. · I hope you will share your thoughts and draw on each other’s ideas. · And I also hope you will maintain and boost your confidence in a better future of China-UK financial cooperation. I am ready to join hands with you to rise to the challenges and seize the opportunities to shape a bright future for both our countries. I look forward to working with you for a great “Golden Era” of China-UK relations. In conclusion, I wish today’s Forum a complete success.